What: It is FANchise Bowl III as the Screaming Eagles visit Colorado for the second time this season. When: Monday, May 8 at 6 p.m. (PST). Where: Budweiser Events Center; Loveland, Colorado. Season Results: Feb. 26 - Screaming Eagles 42, Crush 41 (OT). March 31 - Crush 52, Crush 49. Schedule: May 12 - Crush at Screaming Eagles. Note: These teams will play twice in five days. The Screaming Eagles are 1-8 overall, 1-4 on the road and 1-7 in Intense Conference play. Salt Lake is coming off a 31-29 road loss to the Spokane Empire on April 30. They are averaging 40.1 points per game and are allowing 50.8 points per game. The Screaming Eagles are fifth in the Intense Conference. The Crush are 2-7 overall, 1-3 at home and 1-6 in Intense Conference play. Colorado is coming off a 33-21 road loss to the Iowa Barnstormers on April 29. They are averaging 37.6 points per game and are allowing 53.7 points per game. The Crush are fourth in the Intense Conference. The Screaming Eagles revisit the site of their greatest triumph, as they look to make it a clean sweep in Colorado over the Crush. That one was a thrilling one-point, come-from-behind overtime win. Salt Lake scored at the end of the fourth quarter to tie it before Colorado scored on the first possession of overtime. The Screaming Eagles answered on Verlon Reed's four-yard pass to Zavier Steward. 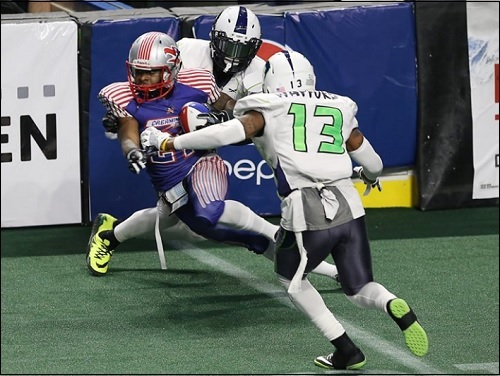 Reed's two-point conversion pass to Juwan Dotson lifted the Screaming Eagles to the win. Steward now finds himself on the Crush's roster. The Crush got some revenge in week 7 as Spencer Groner hit a 36-yard field goal as time expired to break a 49-49 tie to give the Crush the three-point win. Reed, who is a mid-season candidate for Offensive Rookie of the Year, is the clear leader of this offense. He is third in the IFL with 167.4 passing yards per game at 167.4 and third in passing touchdowns with 33. Reed also ranks third in the IFL in total rushing yards with 459 (just three yards behind the Rattlers' Darrell Monroe, in second with 459), and fourth in rushing yards per game at 44.9. As Reed goes, so goes the Screaming Eagles offense. Some help arrives this week as James "Bubba" Poole has been re-activated from short-term IR and could make an impact on offense or the return game. In two games this season, Poole rushed for 41 yards and three touchdowns. Chris Robinson may seem some time in the backfield. Incidentally, Steward now plays for the Crush. With Cy Strahm on season ending IR, Devin Mahina is the go to receiver. He's 6'6" and a big target, who is averaging 9.5 yards per catch with a team-leading eight touchdowns. Dotson is back in the flow after missing a couple games and has caught 30 passes for 226 yards and six touchdowns. Devon Price pretty much rounds out the receiving corps with his 11 catches for 92 yards and a touchdown in five games this season. 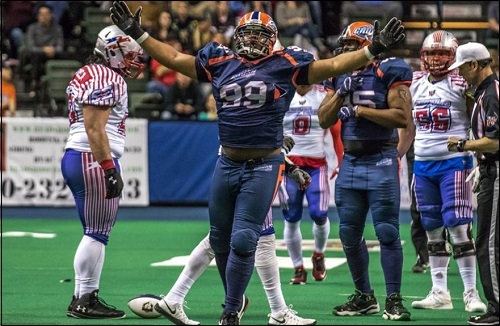 James Calhoun, who has appeared in all three facets of the game for the Screaming Eagles over the course of the season, was named IFL Defensive Player of the Week for his eight-tackle, three interception performance in last week's loss to the Spokane Empire. Calhoun, who splits time in the return game and has shown up on the offensive side of the ball, returned one of those interceptions for a touchdown. Jerome McElroy had 2.5 sacks last week. Ed Burns has 29 total tackles and an interception, and Rashad Greene has 25 total tackles and an interception of his own. Salt Lake has been plagued by penalties this season. They will need to clean that up in order to hold off the Crush. A win over Colorado would be a great we to end their seven game losing streak. 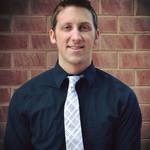 It also would give Matthew Sauk his first win as head coach of the Screaming Eagles. The Crush are coming off a two-game stint of facing United Conference foes Wichita Falls and Iowa. They beat the Nighthawks in a shootout, 77-73, but fell last week to the Barnstormers, 33-21. They have shown marked improvement over the course of the season, despite their hiccup in week 7. Just a week after Liam Nadler was named IFL Offensive Player of the Week for leading the Crush over the Nighthawks, he was largely ineffective against the Barnstormers. Sean Goldrich, who began the season as Colorado's signal caller, was brought in. He had mixed success. With a controversy brewing, the question for new head coach Marvin Jones is: Who to start against the Screaming Eagles. It could be Nadler's job for another week, or Goldrich could have very well installed himself back of the starter's role. Each quarterback has appeared in five games. Nadler has completed 63.5 percent of his passes for 708 yards and 17 touchdowns against four interceptions. Goldrich, with three starts, has completed 54.4 percent of his throws for 401 yards and six touchdowns against four interceptions. Both have rushed for four touchdowns, Nadler on a 8.6 yards per carry average and Goldrich on a 5.8 yards per carry average. Josh Ford is a solid rusher, having amassed 232 yards on 59 carries for three touchdowns. The problem is, he is averaging only 6.6 carries per game. The Crush could be inclined to increase that workload to give the offense more diversity and take pressure on which ever QB is in the game. Ford is also formidable in the receiving game, having caught 22 passes for 123 yards and a pair of scores. Kyle Kaiser leads the receiving group. He and Ford are the only two players to appear in all nine of the Crush's games. Kaiser has hauled in 36 passes for 480 yards and 12 touchdowns. Lovie Rose III and Erick Brundidge have 18 catches for 225 yards, and nine catches for 95 yards, respectively. Derrick Morgan anchors the defense in most major statistical categories, and has for most of the season. Daniel Lindsey has been making a splash as of late. Lindsey has one of the Crush's two defensive interceptions this season. Ace Clark has 31 total tackles and leads the team in sacks with 1.5. Look for Cardelro Jones and Antonio Marshall to potentially come up with some solid play for the defense. To win, the Crush will need to make some defensive plays against a pesky Screaming Eagles' secondary and, on offense, better utilize the rushing game. May 6 - *Iowa Barnstormers (7-2) at Green Bay Blizzard (2-8), 5:05 p.m.
May 6 - Spokane Empire (7-2) at Sioux Falls Storm (8-1), 5:05 p.m. 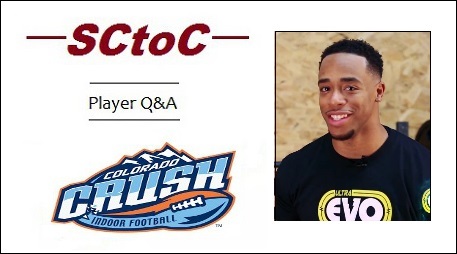 In a special version of our SCtoC Player Q&A, we feature Zavier Steward, who Began the season with the Screaming Eagles, but has now found himself on the Crush roster; a two-for-one for us, so to speak. Steward in three games for Salt Lake, rushing for 33 yards on 18 carries and a touchdown, and caught a pair of passes for four yards with a touchdown. He has seen action in two games for the Screaming Eagles, scoring a touchdown on his lone rush of four yards. He also has returned six kickoffs for an 11.8 yard average. I would say the day after my trainer/father figure's funeral I won MVP of homecoming game and dedicated it to him. Fans can’t call every play because most FANS are just that. Fans and don't know the game. As far as everything else I thought it was a dope concept. The chance to play for an old favorite coach who wanted to get me my NFL opportunity back and be a part of history with him. Taking an expansion team with an unorthodox approach to a championship. My twin brother because he sacrificed A LOT to keep my dream alive. Play six years in the NFL and win a super bowl. All about winning. Lead the league in TDs as an RB. Shock the world and win a IFL championship as a first year team with fans calling plays. Get back into an NFL camp. Being a part of history. First generation Screaming Eagle. Paving the way for the future athletes coming here. Interacting with the fans. My father is a 6"3" Korean Jesus. But, other than that, I love you all. This is a FANchise. Y'all are why we are here; reason (we) exist. I'm going with Nadler this week. If he is ineffective, I think Goldrich wins the job back. I'm voting Nadler. He's shown me more than Goldrich, so I'm more likely to think he's the guy for the job. However, if the Crush lose badly, I'd say go with Goldrich in the next start. Last game coach Jones showed that he was not afraid to make a mid-game change. I say start with Nadler and see where we go from there. So, you think Nadler could be on a short leash? From what I have read from all of you over the course of the season, I think Nadler probably gives the Crush the best chance to win. I hope he gets a chance to keep the job. For some reason I do. I will make sure that I have a good talk with Coach Jones before the game and see if I can get anything out of him to discuss during the broadcast. I agree with this. If Nadler starts out bad again this week, Goldrich should be the QB. If Nadler plays good, he keeps the job. Good source tells me Goldrich has the start tonight. I didn't expect that. I would guess he has a bit of a short leash. Pretty difficult to predict these things! About game time...met Drew. Have a good night watching and listening!!! 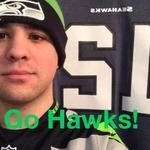 Looking my forward to a great game! Glad you two got to get acquainted. Going to be a fun night.